Looking for an affordable Home Gym packed with features and built to high structural standards? The JX-DS926 Home Gym is packed full options, allowing for multiple users across its 3 different stations. 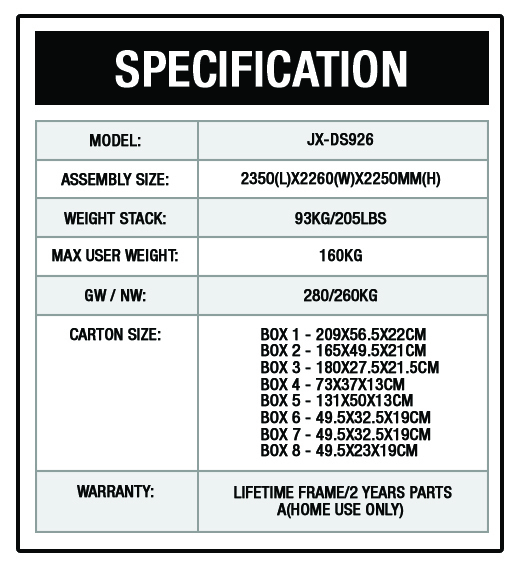 The JX Home Gyms are amongst the most affordable gyms on the market without sacrificing quality! The JX-DS926 offer 3 stations to suit multiple users at one time, so if you're looking for a Home Gym that the entire family can use, look no further. The first of the three stations offers an adjustable Pec Deck/Chest Press machine which also doubles as a row machine by facing forward on the seat. 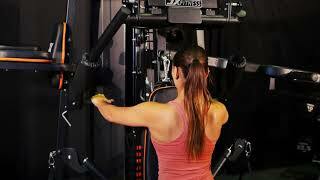 Above your head you will find a lat pulldown bar attached to the weight stack offering a range of lat exercises. The options are truly endless!! The leg press machine is fully adjustable for people of all sizes and also offer a checkered footplate for extra grip. Connected to the main weight stack via pulleys and cables allows the user to push upwards of 90kg!! The second of the three stations includes a bench press leverage gym. This section also doubles as a squat machine by simply unfolding the bar. Again, this fully adjustable option is adaptable for people of all heights. The third of the three stations is a complete chin/dip machine. Use this area to perform chin-ups, leg raises, dips and much more.